The High Line is one example, in a growing list of examples, of NYC’s dedication to creative, well-maintained outdoor space. Besides the huge swaths of land dedicated to Central Park and Prospect Park, New York has recently undertaken the Brooklyn Bridge Park Pier Renovation and will be renovating McCarren Park. There are even future plans to make Governor’s Island into an Eco Park. (Check out the ideas here!). In a city where living quarters can be cramped and limited, it’s imperative to have a variety of outdoor spaces for catching up with friends, enjoying an outdoor concert or activity, or simply for getting some fresh air. 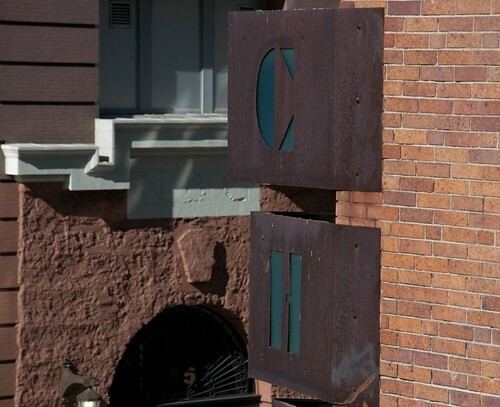 For all of NYC’s density, it is surprisingly easy to find a space for reflection or quiet conversation. Running through Chelsea, the Meat Packing District, and Hell’s Kitchen (spanning Gansevoort Street to 34th Street on Manhattan's West Side), the High Line was a working freight train track from the 1930s-1980, created in ‘order to remove dangerous trains from the streets of Manhattan’. In 1999, Friends of the High Line was formed to turn the decrepit structure into a public elevated park. The team of James Corner Field Operations, a landscape architecture firm, and Diller Scofidio + Renfro, an architecture firm, concentrated on making the space both natural and cohesive. In 2006, a preliminary design was even shown at the MoMA. The High Line puts pedestrians at an uncanny angle: you’re up above the street, with views both towards Midtown's Empire State Building and views below you, watching the taxis rush by. On one side is the bustling city and on the other are views of Chelsea Piers, the Hudson River, and New Jersey. You can even get a distant view of the Statue of Liberty. 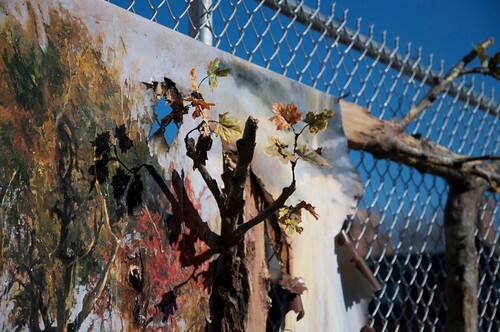 Making the experience even more special, the High Line has commissioned several local artists to use part of the space for integrative art, including Valerie Hegarty’s ‘Autumn on the Hudson Valley with Branches’. This piece is meant to evoke a Hudson River School landscape painting that has been left outdoors at the mercy of the elements. 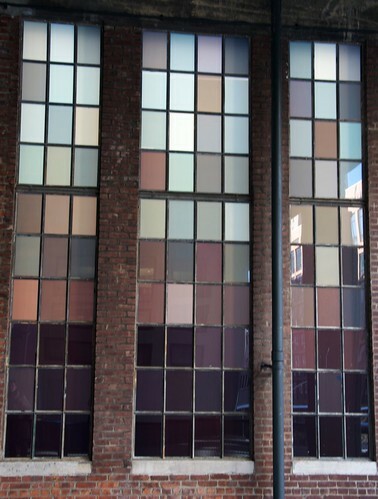 Another piece of public art is Spencer Finch’s ‘The River That Flows Both Ways’. Finch individually made 700 panes of glass to represent the Hudson’s water on a solitary day. The High Line captures the unique, sustainable, and creative (Cheery Observations' tag line!). Besides the obvious restructuring and repurposing of the old railway, the majority of plants on the High Line are native to New York. 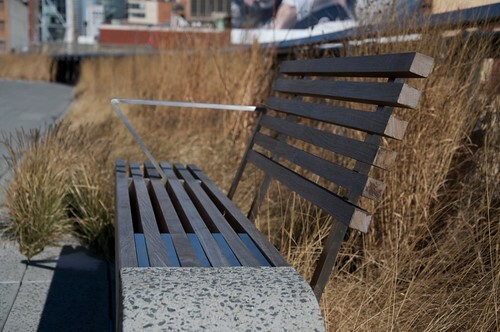 Also, the High Line uses a green roof system to retain water (which is estimated to retain 60-80% of water that falls). The High Line is a welcome addition to the city of New York, and as a resident I am proud of its commitment to sustainable restoration, to local artists and vendors, and as a community gathering space. 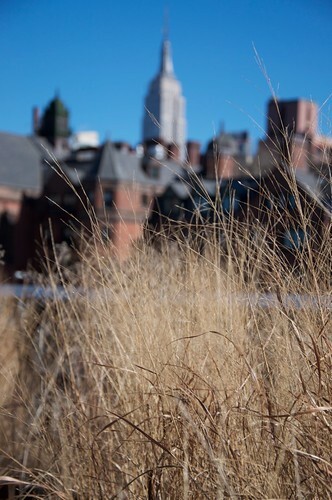 Phase 1 of the High Line has been completed, with Phase 2 scheduled for completion this year. 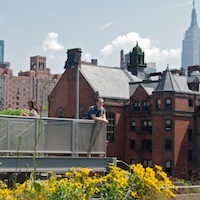 For more information, you can follow the High Line Blog or on Twitter. My brother and sister-in-law were in town this week, visiting Brooklyn and New York for the first time in years.